Both WordPress.com and WordPress.org offer an import script for LiveJournal users, and the process of importing from LiveJournal to WordPress is the same for each platform. Click the LiveJournal link and install the plugin for installing from LiveJournal. Click the Activate Plugin & Install Importer link, and the Import LiveJournal page loads with instructions to import your file. In the LiveJournal Username field, type the username for your LiveJournal account. In the LiveJournal Password field, type the password for your LiveJournal account. In the Protected Post Password field, enter the password you want to use for all protected entries in your LiveJournal account. If you don’t complete this step, every entry you import into WordPress will be viewable by anyone. Be sure to complete this step if any of your entries in your LiveJournal account are password protected (or private). Click the Connect to LiveJournal and Import button. 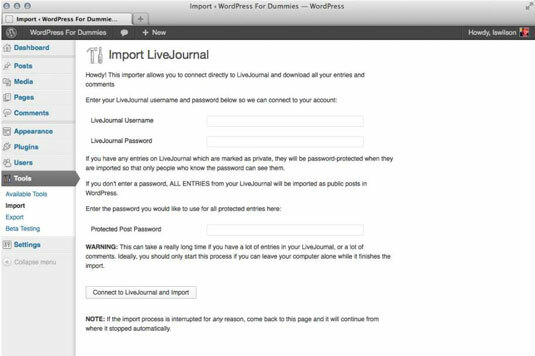 This connects your WordPress site to your LiveJournal account and automatically imports all entries from your LiveJournal into your WordPress installation. If your LiveJournal site has a lot of entries, this could take a long time — so be patient.